The dreaded email newsletter: both loved and loathed, it has come to symbolize the yin and yang of restaurant marketing. If you want to stay in the light and avoid the darkness, we suggest these ten tips to keep those open rates high and your subscriber list growing. Think about the things you read every day and the way they are organized. We are all short on time and value knowing what we are getting. It inspires trust. So make the effort reach the same level of excellence you achieved yesterday. Make them drool at the prospect of coming in. A picture is truly worth a thousand words. 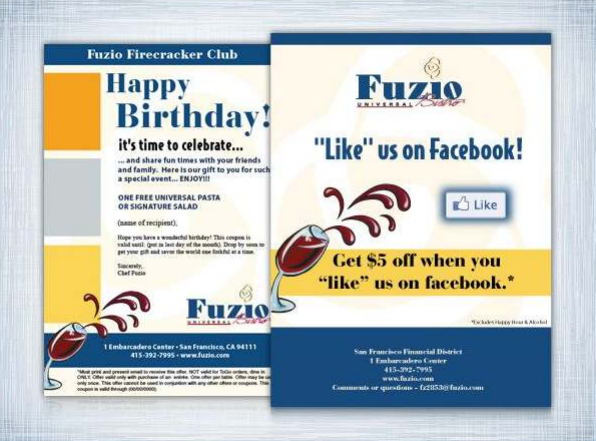 Use some fun design too like what we did on the Fuzio eblast above. Include the links to your social pages by deploying social icons in a spot that is easily seen. Your audience loves sharing their experience on social media when it comes to food. You want to take this opportunity to catch them where they are by suggesting they like or follow your page. 4. Use calls to action. Encourage them to actually do something. Getting them to open the email is one thing (see the next tip) but getting them to act on it is another. You need to tell them EXACTLY what to do. Remember that while they are reading it, three or four other things are competing for their attention. 5. Place a benefit in the subject line. This is the key to getting your open rate beyond the industry standard. “What’s in it for me?” is a reader’s first thought when they click “open”. Remember that and reward them for it. >>Jumpstart Your Brand! Get a FREE 30-Minute Restaurant Brand Assessment. 6. Give away a recipe. We love this tip because it’s unexpected. Very few restaurants do it. This is the sharing economy and an entire generation of patrons expects small acts like these. Do it and watch your followers increase across channels. No, not machines…people! We are all pressed for time and heat maps show that readers scan emails quickly looking for highlights. Place your call to action and relevant information in a prominent position. Give your final product to a trusted colleague and ask them to look at it for five seconds and repeat what they saw. 8. Include a “Subscribe Here” link. It blows us away how many emails we see that drop out the “Subscribe Here” link. It’s a rookie mistake you can’t afford to make. Not everyone will be signed up, so increase your list by always including a link for new subscribers. This gets back to the time issue again. Keep it to once a week and they’ll look forward to it. Less is more when it comes to email best practices. 10. Forward to a friend and get something. Another tip we absolutely adore. It says so much about you and your generosity of spirit. It makes people wonder what else you’d be willing to do if they simply showed up at your restaurant. Be classy and reward those who care about you. We hope you enjoyed these email marketing tips. To discuss your email marketing strategy, call us at 951 479 5411.